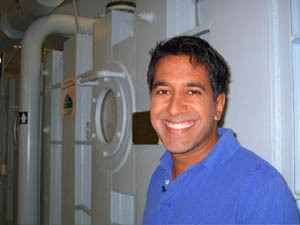 Dr Sanjay Gupta, the neurosurgeon who has become a familiar face across the United States as a correspondent for CNN, has been offered the job of surgeon general by President-elect Barack Obama, the Washington Post reports. When contacted on Tuesday, Gupta, 39, did not deny that he plans to accept the offer but declined to comment, the Post said. The surgeon general, who leads the US Public Health Service Commissioned Corps with the rank of vice admiral, acts as the government’s spokesperson on matters of public health. Lately, the office has not enjoyed a high profile, but that is likely to change with health care being a priority for the incoming Obama administration. The Post reported that Gupta would also get a top position in the new White House Office of Health Reform. “It’s a great choice,” said Dr Atul Gawande, associate professor of surgery at Harvard Medical School and staff writer for the New Yorker magazine. Gupta’s parents, Subhash and Damyanti Gupta, are immigrants from India. He grew up in Michigan and received his undergraduate and medical degrees from the University of Michigan. Gupta, who joined CNN in 2001, has covered the 9-11 attack on the World Trade Centre in New York , the war in Iraq, the tsunami in Asia and the aftermath of Hurricane Katrina. While embedded as a reporter with US troops in Iraq, he also performed surgery. Gupta contributes periodic reports to CBS and writes a a column for TIME magazine. He has written a book, “Chasing Life,” and is the winner of numerous awards. Gupta is associate chief of neurosurgery at Grady Memorial Hospital in Atlanta and a member of the faculty at the Emory University School of Medicine. Gupta, who was named one of People magazines’s sexiest people alive, and his wife have two children. According to the Post, a third child is on the way.